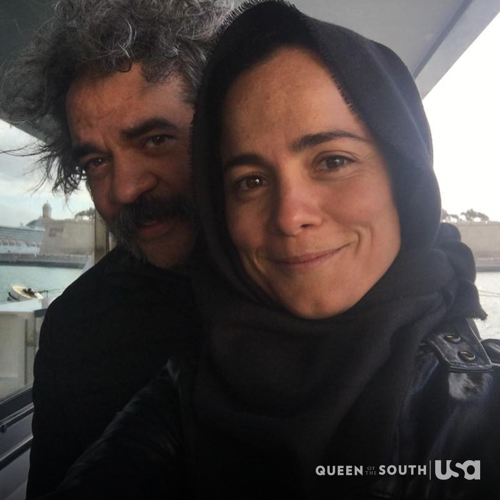 James had been there to lend a hand at the exact moment that Teresa needed him on tonight’s all new episode of “Queen of South”. It was almost too perfect that it was him that came to her rescue because James was supposed to still be in the states and so Teresa had been wary of him. James had gotten her away from danger and, after he did, she pulled her gun on because she knew she couldn’t trust him. James was once very loyal to Camila and could still be her greatest foot soldier, so Teresa kept a gun on James as she told him where to go next. She had called Pote to warn him about the danger and she arranged to meet with him at the safehouse while they try to figure out what to do next. Teresa was wanting to play things smart and not make any rash decisions. And so she wanted to test James before she allowed him to know where the safehouse was. Teresa had James pull over at a deserted location and she questioned him. James knew where to find her and so she asked him where he got his information. He claimed that he heard people were moving against someone they called “the princess” and that he looked into it out of curiosity. James said that once he found out it was Teresa in danger that he moved quickly to get to her before whoever called in the hit did. A likely story! It just didn’t explain everything and so Teresa asked James about Camila. James said he wasn’t with Camila anymore because they parted ways some time back and Teresa wasn’t sure if she could believe him. She had zip-tie himself and get in the trunk of the car. Teresa didn’t want him to know where she was going because she was collecting some of her assets before she met with Pote and, as it turns out, Pote got held up. He ran into some armed men that waylaid him before he could leave his house and so all Teresa eventually had a telling conversation with Pote. Pote answered his phone with a gun to his head and he told Teresa that she should meet him at the port. He was told to tell her that they needed to catch the ferry and he only said that because he knew right away Teresa was smell the trap. She did and she knew that Pote would be murdered after their conversation. It broke her heart because he had been with her for so long and so she tried to go on without him when she saw that Camila’s men had even found the safe house. Camila had devoted all of her resources to finding to Teresa. Teresa had killed her husband and it hadn’t mattered that Camila’s relationship with him had been troubled. Epifano was someone she loved and he was the father of her only child, so Camila wanted blood. She told General Cortez to do whatever it takes to get Teresa and he was willing to do that however that didn’t mean he wasn’t also working behind Camila’s back himself. He was reaching out to the leaders of the cartel in an effort to setting himself up as a drug kingpin and part of his strategy in doing that was telling everyone they could stick it to Camila by going back into business. She wanted to move away from drugs because she wanted to respect Epifano’s last wish in making sure Isabella lived differently. Neither Epifano nor Camila wanted their daughter to grow up doing what they did in the drug business. Camila tried to keep Isabella from finding certain things out and unfortunately Isabella kept butting in. She noticed that her mother had a glow and so she asked if it was about Teresa. Her mother cracked and said she would be dead within the day. Camila truly meant those words and had actually been shocked when it proved difficult to kill Teresa. Teresa got rid of the men that came for her at the safehouse and she later got arrested with James by the Malta police. The police had taken a side street and Teresa thought that would be the end for her but it was instead Rocco de la Peña. Rocco had paid off the police to bring Teresa to him and then waited until Camila’s men arrived because Rocco wanted to kill the men in front of Teresa. Teresa had previously negotiated a deal with him for four percent and he believed by offering her his protection that the least she could do in return was give him six percent. Rocco didn’t have to offer Teresa protection or tell Camila that it best she didn’t interfere on Malta because it was his island and he did that to ensure Teresa understood which side her bread was buttered on. She was setting up her own drug business that they she needed to play things a lot smarter than what she had been doing before and so she agreed to the extra cut that Rocco wanted to take. Rocco kept Teresa and James alive and they in turn went looking for Pote. Pote had been tortured and his hand had been broken beyond repair, only he had been left alive. He hadn’t been okay because torture still got to him and the loss of his hand had left him in tears. But he never sold out Teresa and Teresa never doubted his loyalty. She still had her doubts about James and so James told her why he went looking for her. He began working for Devon and someone stole a shipment from them. James had found everyone responsible and there had been one person that Devon felt for sure had played a part despite James finding no evidence of this. And so James broke into this man’s house to kill him and he couldn’t because there was a small child in the house that screamed when she saw him. James reminded Teresa that she always believed there was another way of doing things and that’s why he went he sought her out because he wanted to do things her way. Teresa agreed to take on James and she warned him that he’ll be working for her not with her, so the two came to an agreement.